And then, when I wasn’t even looking for a blanket, I found you. I was in Emart to buy bread. You were in Emart because someone had returned you and thousands of other heartless, judgemental shoppers had rejected you. Well, dear blanket, I decided to take a chance on you, you and your pumpkin pattern. I’m not sure what it was that made me give you a second chance. Some might call it a great sale, but think of it as destiny. Blanket, you taught me tolerance. I will no longer dismiss things based solely on their pattern. You have proven to be so much more than a Halloween-themed textile. In fact, you have restored my faith in life’s little surprises because you, dear blanket, are not only a blanket. Oh, no. Hidden inside your Korean packaging was a fantastic surprise: a hooded cape. I didn’t know how much my life was missing a hooded cape until I found you. So thank you cape, for reminding me that you can’t fall in love if you don’t take a chance. 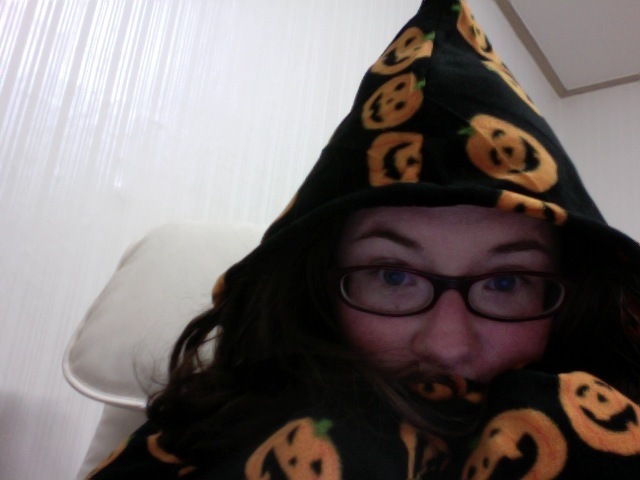 You look adorable in your hooded pumpkin blanket/cape. This adds a whole new dimension to halloween. One thought it was in October but lo and behold everyday is halloween in some countries. Now that’s culture shock!!!!!!!!! I agree with earlier comments, you look great with pumpkins on your head! As usual, so enjoyable to read your blog.